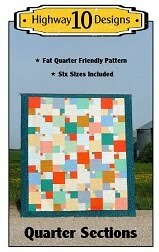 It’s that time again Blogger’s Quilt Festival and I thought I would share our Lug Nuts quilt. 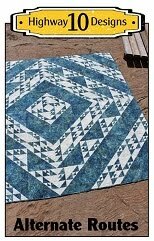 If you are new to my blog I am a longarm quilter that has started designing quilt patterns with my friend Lori Suss, we call our design company Highway 10 Designs. I live near Flin Flon, Manitoba (hence all the snow in the photos!) and Lori lives in Dauphin, Manitoba and the highway that connects use is Highway 10 so that name just seems to fit us perfect. 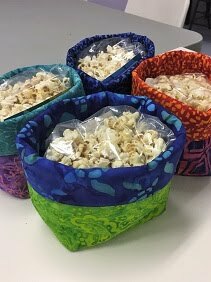 Our Lug Nuts pattern creates oversized Hexagon using 9 fabrics. 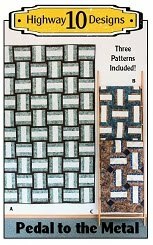 We used Little Black Dress 2 fabrics and chose 3 ivory, 3 grey and 3 black fabrics for our quilt but it can be made with any 9 fabric, 3 color combinations. I quilted it with a pantograph called Fascination, used So Fine thread and Quilter’s Dream Blend batting. We had fun with the backing as we had a few blocks left over. 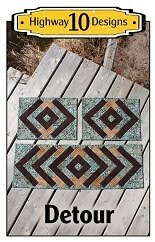 You can find this pattern in our Esty shop here. 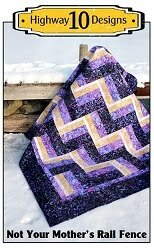 I’ve entered this quilt in the Original Design Catergory in the Bloggers Festival. Hope you’ll head over there and check out all the other quilts in the Festival! I love this design, and the fabrics you used make it absolutely stunning! Awesome quilt. I love the combination of black and white in the over sized hexies. Great quilt - and aptly named! Your color choice really makes this special. Love it. Lug Nuts looks great. Perfect with this fabric and your stunning quilting. Very striking! The back panel is really effective too! I love the design on the back ...just as pretty as the front. Im a big fan oversized hexagons and I must say that this is one of the most lovely quilts I've seen from the genre. Those fabrics are just perfect to showcase the hexies! Such a lovely quilt. Your business name is fantastic too! Love your quilt! I love the piecing on the back! Hexies have been speaking to me lately and your's are beautiful! Good luck with the festival! I like it a quilt! Beautifully! Original! Great! Wow, that is really effective. I love it, and will vote for it right now!